It's been pretty quiet on the HMH homefront...on the blog anyway, because it certainly isn't in our house! Sorry about the silence, but we've been planning our next big project. We've decided our next project will be our master bedroom makeover. All of the bedrooms in our house are pretty much untouched. Of course they look somewhat styled, but not exactly what the end result (in my head anyway) will be. Our master is on the first floor and right off of the living room, so it is visible at all times. I want to give it that real master bedroom feel. Right now the only reason you would think it's the master is because it has a walk-in closet and attached bath, but other than that nothing screams "this is where the magic happens!" Well that's all about to change! I've had a vision in my head for quite some time, but I thought it would be best to put it on "paper" for the sake of "G" (that's what we'll call him). We can't seem to get it together when planning a project, because he has one thought and I have another. Me putting it on paper, puts it in stone! The focal point of the space will be the built-in fireplace and cabinets. We plan to use Pax cabinets from Ikea like these from House*Tweaking and the fireplace will look similar to this. I've started a board over on Pinterest if you want to follow along as I create this masterpiece on paper and save a few bucks to actually get started. Hopefully we will be revealing a new and improved master bedroom, sooner rather than later. But for now we will be sharing bits and pieces of the makeover as we go. 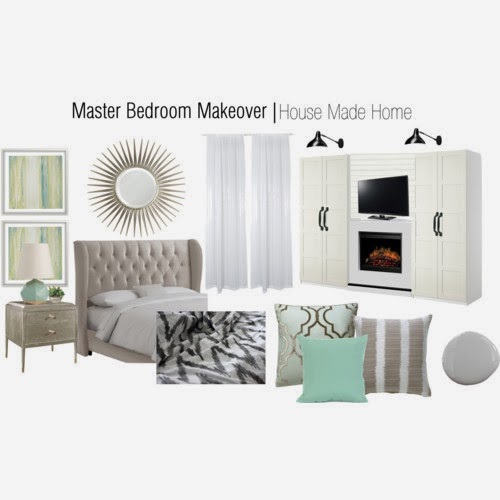 What room in your house needs a makeover or revamp? Don't forget that HMH now offers e-Designs and Mood Boards. We are currently offering 50% off of any service until the end of February. So book your consultation today.